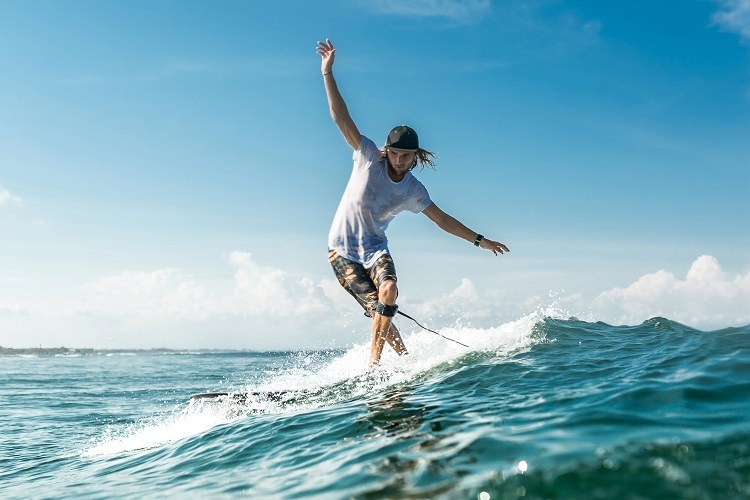 Following with our guide to surfing in Fuerteventura, today we will talk about the parts of the board, the basic movements that you should know to start in this sport and some of the most famous maneuvers of surfing. Nose: It is the tip of the board, slightly curved to facilitate maneuverability. Tail: It is back or tail where the plug is placed, then tie the leash or invention. Deck: this is the name of the upper part of the table, while Bottom is the bottom of the board, the lower part. Rocker: it is the inferior curvature of the surfboard and there are many shapes. It influences the reaction capacity of the board, for example if the rocker is very pronounced, the board will be more maneuverable but slow. A flatter rocker will give you more speed but less ability to maneuver. Finds: They are the keels they drive the water that goes under the surfboard. Rails: are the edges of the Surfboard. They can be sharp, rounded or mixed. The ideal is to practice this movement several times out of the water, the more you train the takeoff, easier it will be when it comes to being face to face with the waves. Lying face down, with your hands at the level of your pectorals, raise your head, shoulders and bend your back. Once you are standing, keep your body perpendicular to the board, with your feet parallel to each other and keep your balance. When you have mastered the takeoff, it is time to start practicing other maneuvers. Take Off: it’s the basic maneuver. Bottom Turn: is the turn that is made after takeoff, at the bottom of the wave. Cut Back: it is a 180 ° turn back to return to the wave and recover the energy. Floater: maneuver that involves surfing the lip or crest of the wave that is about to break. Reentry: climbing up the wall of the wave to the edge, it turns sharply 180 ° to go back down to the starting point. 360: consists of making a complete turn in the air with the board from the back or leaving the wave. Aerial: The different combinations of maneuvers where the surfer jumps on the wave and catches it again. Tube: A difficult maneuver, the most dreamed by surfers. It consists of sliding inside the tube created by the wave. Motorhome and Winter Care Related to Water » « In Motorhome Discover 7 Canarian Destinations and 7 Curious Facts! In Motorhome Discover 7 Canarian Destinations and 7 Curious Facts! © 2019. Ventura Van. All rights reserved.